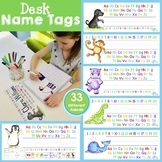 Welcome students to their new desks and hooks with these cute customizable name tags and desk plates. Desk plates feature the alphabet with highlighted vowels, a number line to 20, and left and right clearly marked. 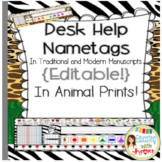 Name tags with a jungle theme. 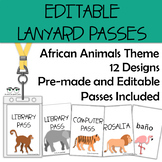 Giraffe, leaves, tiger, lion, leopard, zebra borders. Saved in sets of 20. 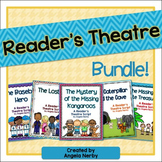 Text box and font are already set up - just plug in your student's names and print! 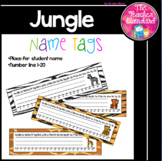 This file includes Tiger Theme name tags with a number for organizing your class. 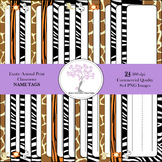 There are 30 tags in all, that contain a place to write a student's name.